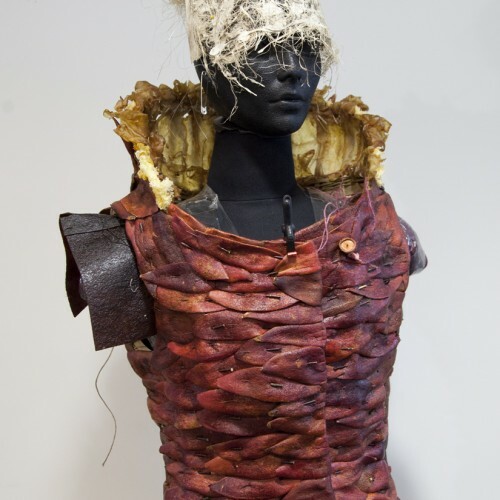 My latest Weedrobes garment is a fruit inspired two piece ensemble with a jacket made from pomegranate peels, which was inspired by my experience with this material while in Germany working on a dress for Weleda. The sleeveless jacket also contains details made with dried mushrooms and fish maw around the collar and armholes. 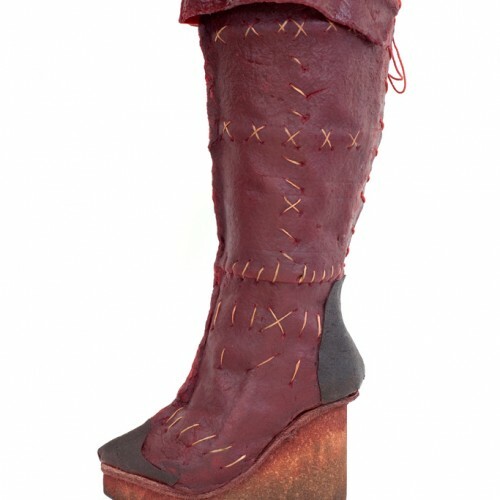 The boots are made with pomegranate fruit leather on a cork platform heel. The skirt is woven with wool and Asian red dates. The concept for this project is based on the Greek Persephone myth where a young woman is abducted by Haides and brought to to rule the land of the dead. 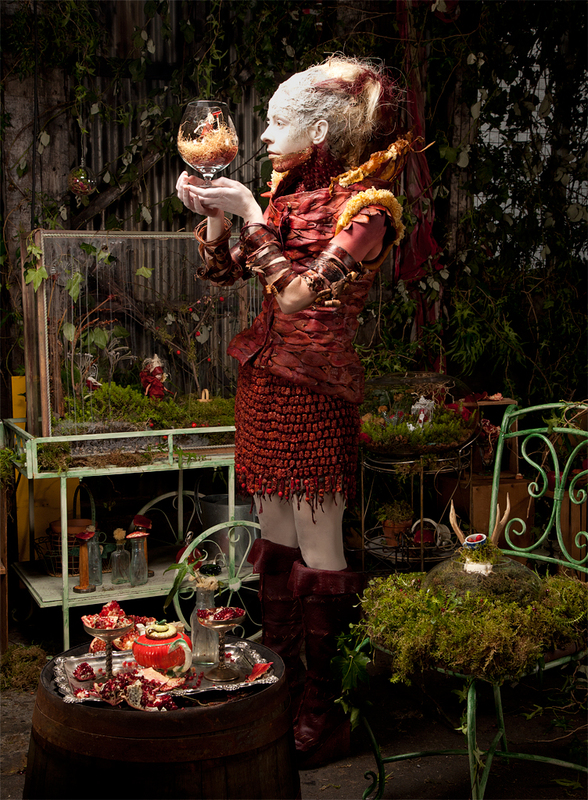 She is rescued by her mother Demeter but eats a pomegranate seed, which keeps her returning to the underworld every year. 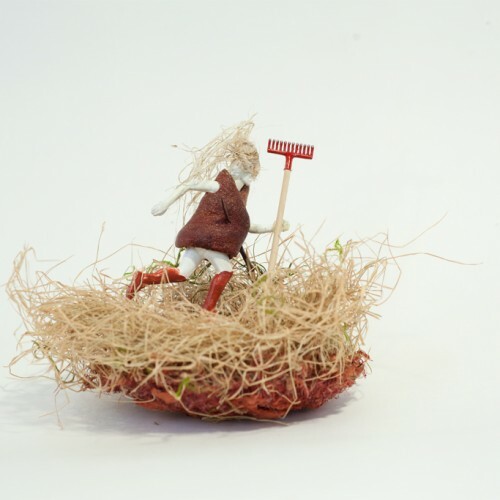 It is a rich story explaining the return of spring but like many of its ilk, it blames the woman. It is said that early tales of Eve have her eating a pomegranate, not an apple. 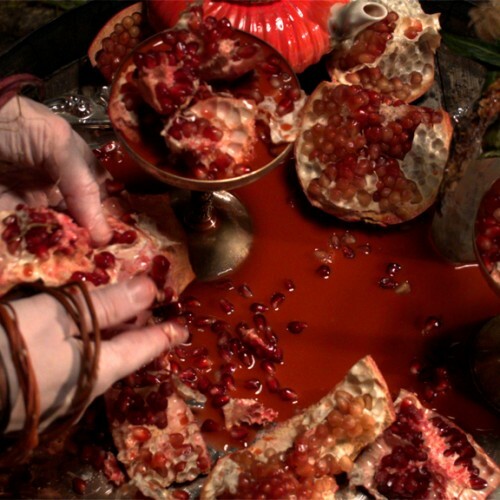 In my version of this scenario Persephone eats the pomegranate not as a punishment but instead for it’s healing properties to help her survive and re-integrate into the world. She lives in a dystopian world ravaged by floods and fires, confined to the ancestral orchard warehouse where she has built a home for herself. 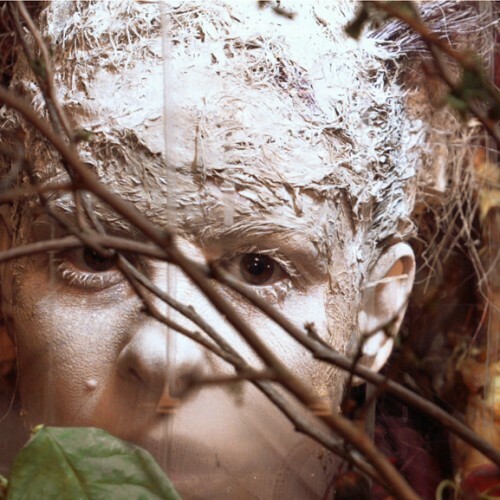 The engulfing masses of invasive weeds are now creeping into her living space and she is experiencing a shift from being the dominant species to adapting to nature. 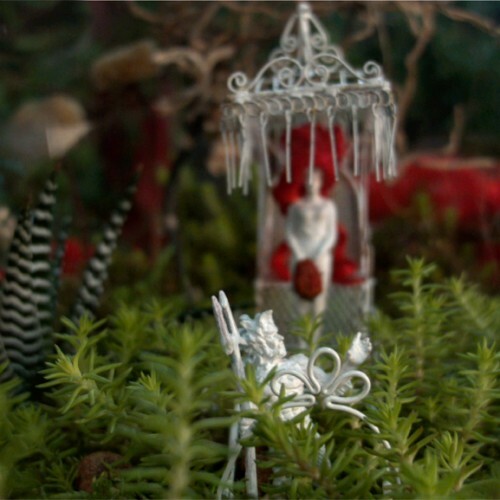 In her isolation she becomes very childlike and builds terrariums with effigies of herself in various scenarios recounting her happy childhood in the orchard. 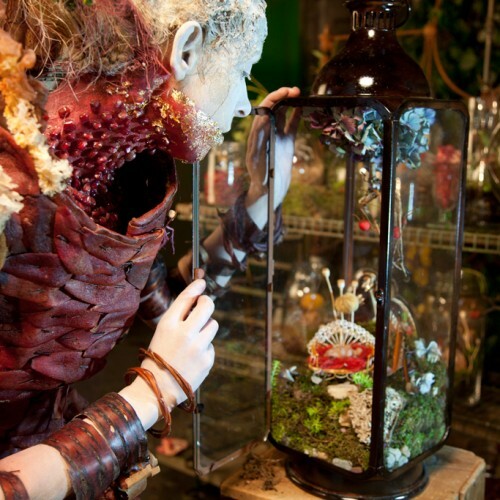 This creative process helps her deal with her solitude and her fear of the encroaching natural world swallowing her up. 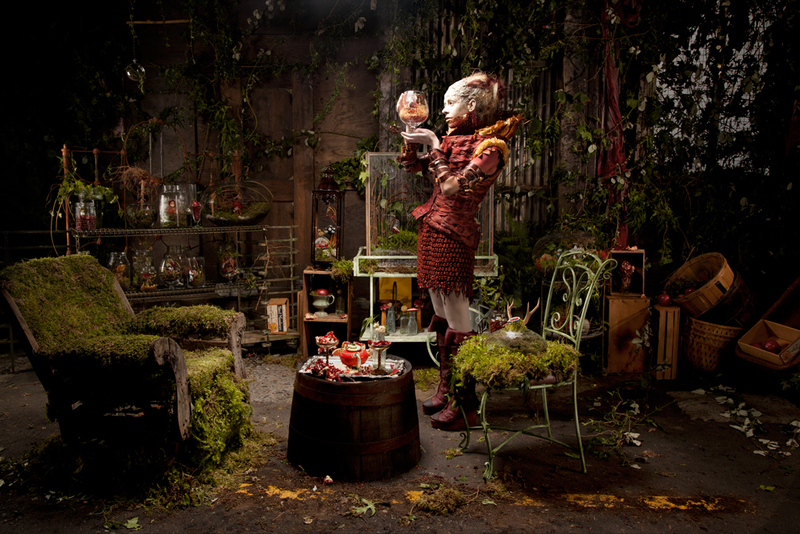 She sets up a space for tea and prepares for the eventual visit of others of her species. As there are no such locations in Vancouver, we dressed one of the old parking garages on Granville Island. If you look carefully you can see the yellow line on the ground. I am grateful for the assistance of CMHC in allowing us to use the space and provide us with a warm green room. Special thanks to all who came to my Pomegranate Peeling Party, where we pared over 50 fruits in exchange for fresh seeds. 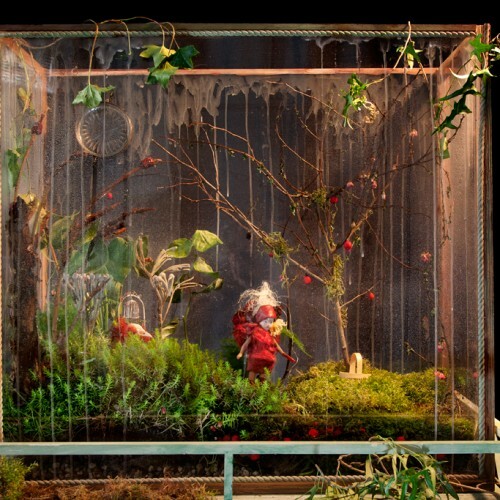 Also special thank you to my wonderful assistant Evgenia Pankeeva and to Tanya Hockley and Doris Ecker, who helped create the terrariums. Jordi Sancho, who is always a pleasure to work with, was my photo assistant. The super talented Keith Murray created the fantastic makeup, which involved gluing over 100 fresh pomegranate seeds to the model. Last but not least, my favorite performer and collaborator, Nita Bowerman embodied Persephone and brought the character to life for us all.